Readers who are unfamiliar with the concepts associated with modernism and postmodernism will find Davis' arguments around the idea of dismodernism difficult. I certainly did, although I must say the effort was worth it. Davis presents his works with clarity and helps the reader to 'keep up' with him through the use of practical and clear everyday examples. He discusses the role of protective legislation with authority, although his political position on this matter is clear. This doesn't detract from the book, rather, as a reader I found myself able to relate to the author's honesty. There is an abundance of ideas in the text. If you are expecting a book that takes an idea and develops this throughout the text, then you will be in for a surprise. Davis, himself, talks about this text as a collection of papers. This is an accurate description, although the underlying theme is disability and disability studies. Some sections of the book do leave the reader wondering about relevance to the general theme (for example the discussion of Jan Svilt, a homosexual eighteenth century sailor). Granted I may have missed the point and subtlety tends to allude me, but I kept looking for some reference to disability. Frustrations about Jan aside, I found the book compelling. I particularly enjoyed chapter 8, which provided an insightful discussion of hate crimes against the disabled. The chapter begins with a recap of the James Byrd Jr., case in 1999. Davis informs his reader that not only was Byrd African American he was also disabled. What ensues is a discussion of the relative importance given to issues of race in relation to hate crimes and the relative unimportance of disability. However, the evidence that Davis provides to illustrate the level of abuse against disabled individuals is nothing short of disturbing. 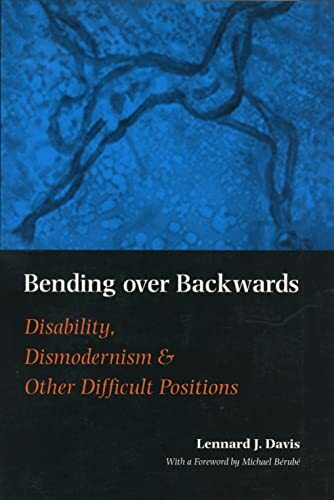 The way in which society deals with disability has changed over time, according to Davis, and reflects to some level the necessity for individuals to function as workers in an industrial society. Consumerism contributes towards the perception of an ideal body, but Davis argues that all bodies are inherently flawed. We are all flawed in some way and the ideal body is one that no one will achieve. Sorry Elle! Don't think that this text is about the desperate and unchangeable status of the disabled. Davis provides plenty of hope for change, and suggestions for facilitating that change. Disabled individuals have so much to offer society and it is this view that Davis weaves throughout the text. All up, it was a thoroughly enjoyable book and hopefully we will see more interest in disability studies in the future.